The varsity swim team won the Conference of Independent Schools Athletic Association (CISAA) overall men’s championship for the fourth straight year, the open championship for the eighth consecutive year and the senior (U20) championship for the third time in four years in 2014. Varsity relay teams picked up gold and bronze medals, helping UCC to finish third overall out of 270 schools from across the province in the Ontario Federation of School Athletic Associations (OFSAA) swimming championships. The Prep and U14 teams have also claimed several consecutive CISAA championships in recent years. From Grade 3 to Grade 6, every Prep boy learns to swim at UCC’s indoor pool as part of the physical education curriculum. Boys are taught key swimming concepts — such as propulsion, resistance and flotation — and various swim strokes. Grade 6 boys also learn snorkelling. Boys in Grades 5 to 7 may join the swim team from November to March. The goal is to help boys develop comfort with training and competition. Coaches help boys develop skills such as character, teamwork and self-discipline for future success out of the water. Every student is taught all four competitive racing strokes: freestyle, butterfly, breaststroke and backstroke. They also learn proper racing starts and turns. There’s no cap on the number of swim team members. Every boy who wishes to represent the school may do so at various championship meets. The swim coaches work with each student no matter their skill level to advance their performance. 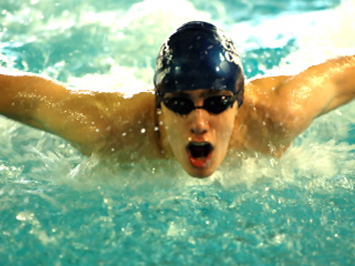 The Upper School swim season runs from mid-November to the OFSAA championship in March. Boys can compete on the Under 14 and varsity teams. Boys train in UCC’s state-of-the-art athletic facilities, which include a renovated indoor pool. All boys who come out for the team learn proper technique, rules, turns and starts for all competitive racing strokes — including freestyle, backstroke and butterfly — regardless of skill level or previous competitive experience. This gives all boys a chance to participate in the regular season, with the possibility of competing in the CISAA championship.